PALM SPRINGS, Calif. -- The young officer had just returned to the police force after maternity leave. The older one was two months short of retirement. 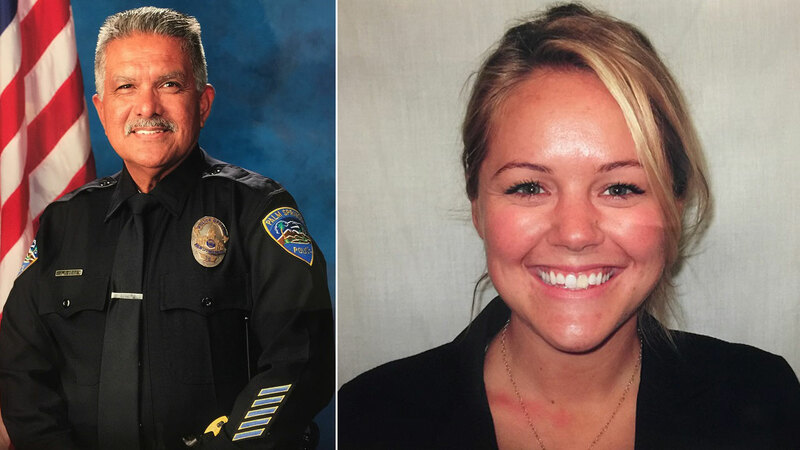 Both Southern California officers were fatally shot over the weekend, allegedly by a gang member "acting crazy" and intending to shoot police, according to his father. Palm Springs police Chief Bryan Reyes identified the officers slain Saturday as Jose "Gil" Gilbert Vega, 63, and Lesley Zerebny, 27. A third officer was wounded after police responded to a domestic disturbance call. The suspected gunman's father told a neighbor his son was armed, "acting crazy" and wanted to shoot police. John Felix, 26, was apprehended early Sunday after a lengthy standoff and will be charged this week with murder. Felix finally emerged wearing soft body armor and carrying ammunition but no weapon after police shot a chemical agent into the home where he had holed up, officials said. "Here he is, 35 years in, still pushing a patrol car for our community to make it better - on a day he wasn't even scheduled to work," the chief said. Reyes said Zerebny "pressed forward every day to make it better for everybody else." She and her husband, a sheriff's deputy, were new parents to a four-month-old baby. "To see her laying down with her eyes open and to witness her husband in full Riverside County sheriff's uniform ... kiss her on the forehead for the last time... it's tough," Reyes said, fighting back tears. Investigators were trying to piece together what led up to a 911 call about a family disturbance that preceded the cold-blooded killings. A neighbor, Frances Serrano, told The Associated Press that the suspect's panicked father, Santos Felix, earlier said his son, an admitted gang member, had a gun. "My son is inside and we're scared, he's acting crazy," Serrano said the older Felix told her. When it was suggested they call the police he said, "Yeah, he already knows they are coming, and he is going to shoot them." Serrano said she went back inside her house and within minutes police cars arrived and gunfire erupted. Police said John Felix suddenly pulled out a gun and opened fire on the officers who had responded to a disturbance call Saturday afternoon at the home he shared with his parents in a quiet neighborhood of single-story ranch homes in this desert resort city. Zerebny had been with the department for about 18 months and recently returned early from maternity leave after giving birth to a daughter. Vega, a married father of eight, was a 35-year veteran who planned to retire in December. He had been working overtime Saturday on his scheduled day off. A vigil was held outside police headquarters Sunday night to honor the two slain officers. Mourners created a memorial that included flower bouquets, written messages, candles and balloons. The wounded officer's name was not released, but police said he was released from a hospital Sunday. Reyes said previously that the officer was alert and speaking with investigators. District Attorney Michael Hestrin said John Felix would be charged Tuesday with first degree murder and several other felony counts. Prosecutors would decide within two weeks whether he could face the death penalty, Hestrin said. It wasn't known Sunday if John Felix has an attorney. Court records show John Felix is a gang member who was previously sentenced to four years in prison in a failed murder plot in 2009. Documents cited by the Desert Sun newspaper reveal he was charged with attempted murder but pleaded down to assault with a firearm and admitted his gang connection. Documents also show John Felix was the subject of a forceful arrest three years ago at the same house where Saturday's shootings occurred. It had been 54 years since an on-duty uniformed police officer was killed in Palm Springs, a city of 45,000 residents about 100 miles east of Los Angeles, known for its desert views, boutique hotels and golf courses. The Palm Springs shooting occurred just three days after a popular Los Angeles County sheriff's sergeant was shot and killed in the high desert town of Lancaster. Sgt. Steve Owen was answering a burglary when he was shot. A paroled robber has been charged with murder.